This is located on the side of our building, right off the west side of our parking lot. This room is home to our overflow breads, produce and sometimes dairy products. 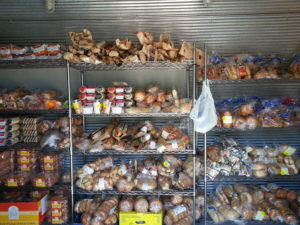 Typical items include rolls, bagels, English muffins, and baguettes. If we have a large donation of produce or dairy, we will put those items out there as well. We try to keep this room stocked when foods are available. There are no forms to fill out, and you may come as frequently as you and your household needs.